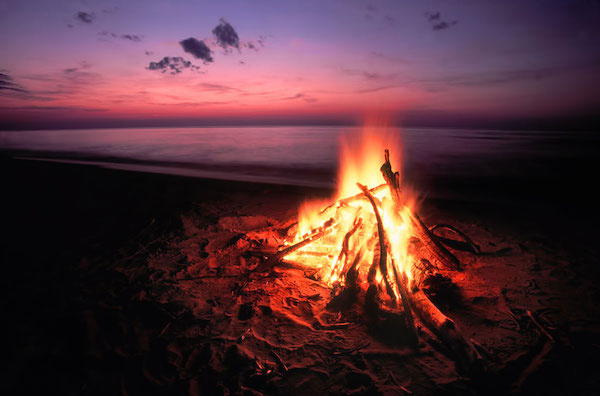 Beach bonfires should be no more than three feet high or wide and contain no construction scraps. The seashore never goes out of season, not when you can cozy up to a roaring fire along the shoreline any time of year. Best to know the rules before striking the first match to a fire along Corpus Christi beaches, however. Here are a few tips from Scott Cross, director of Nueces County Coastal Parks. • Keep your campfire small. Regulations state that fires should be no bigger than three feet high or wide. • Build your fire in a barbecue pit or bring along a shovel to make your own pit by digging a hole in the sand. A sand pit helps block the wind when you're lighting the fire and makes it easier to douse when you're done. • Stay far, far away from buildings, vehicles and dunes. The further away the better, as coastal winds are notorious for blowing embers around. • Use wood that’s actually meant for campfires. No construction or scrap wood, which can contain nails and screws that are dangerous on a beach anywhere, anytime. Bundles of firewood are inexpensive and available at hardware, grocery and convenience stores in the area. • Never leave a fire unattended. When you’re done and ready to go, put the fire out completely. Don’t leave any embers behind! You can bury the coals once they are thoroughly doused with water and cold, but do not bury a live fire. • Don’t forget the ingredients for s’mores and hot dogs! And bring a few blankets to keep your back warm as you cuddle around the warm flames enjoying the sounds of the waves and the twinkling of the night sky. Continue reading on down the article please! Second to last bullet point: • Never leave a fire unattended. When you’re done and ready to go, put the fire out completely. Don’t leave any embers behind! You can bury the coals once they are thoroughly doused with water and cold, but do not bury a live fire.